What is ‘Cuddll’ and Why Do We Need It? In the times when uninspiring and boring job, work-life imbalance, hectic travels, high dependency on technology, no hobbies to brag off, long distance relationships, mid week-stress and Monday blues have become hard truths of our life, the need of the hour is to act selfish and do things that make us alive. It is high time that we work towards making ourselves happy than keeping a count of reasons that make others happy or unhappy. Cuddll comes in there where you don’t know where to start from!! I am sure the name sounds fun. Doesn’t it? Cuddll is all about coming together. It is an app that helps users to discover people who are willing to engage in group activities around them. In a more interesting way, it is also called the Airbnb of social gatherings. 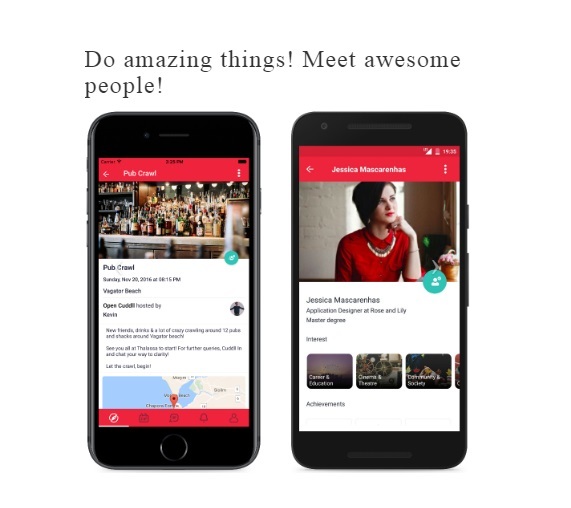 It enables users to meet new people, plan a social gathering, share the experience with each other, etc. without sharing phone numbers or connecting on any other social medium. It is about discovering a new friend or finding someone who is just like your long lost pal. Life is not to be lived in isolation and I feel its never too late to make friends.Also, it is absolutely not necessary to mingle with your uninspiring colleagues for Friday evening drinks when you can revive old hobbies with new friends. Give it a thought…. I am glad this is beyond a dating app. We have had enough of them. Also, I feel we need more reasons to meet, have social interactions than just getting involved romantically. And its not important only for girls to meet boys and vice versa. We can have two girls or two boys connecting through ‘Cuddll’ because they both love going for art walks or have a common fascination for running, swimming or more. There are many others who love going for pool parties or clubbing but are shy to go alone. There would be others who might have left job or moved to another city and would be looking for ways to get involved in constructive activities. 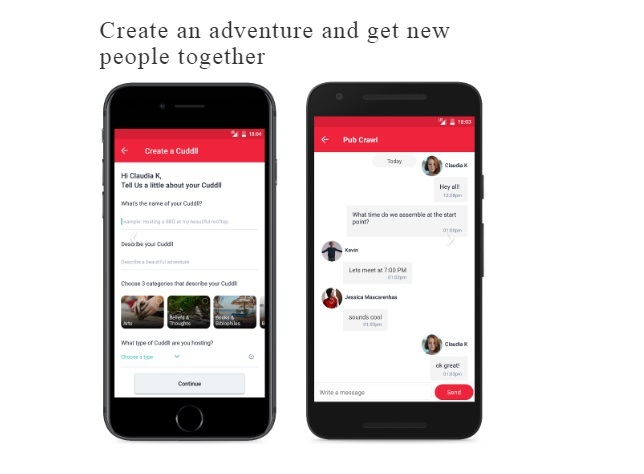 Cuddll is the way to discover and chat with other users who are also looking to attend the same gathering. How did I come to know about it? Well, I struck upon it through a friend who is tech savvy and keeps checking out every new app in the market. And she was pretty excited about this one when she found a friend to go for late night movies. Anki, this friend of mine is a big Bollywood, Hollywood, Tollywood fan. She is a big movie buff and hates to miss any first day shows. Her only problem is that she can’t do things alone. She needs a friend to go with, to eat popcorn with and to discuss movies . There are times when I catch up with her but its tough to be with her every week because I don’t have the same enthusiasm as her or I have other priorities. But her new friend, Ruby shares the same wavelength and energy as hers. They can eat movies, sleep movies and talk movies endlessly. I love their connection and I am so glad that they found each other. Interestingly, they live close by and it becomes easier for them to pick and drop one another while going for movie dates (as I call it). Cuddll is quite like school where you picked friends only if you liked them! Some of you might say why do we need Cuddll when we have friends. But, tell me how many of us are lucky to be living in the same city as our school or college friends. Or even if they live, how regularly do we catch up with them. Everyone has different priorities and people have become busy. It is also not necessary that a friend with whom you played cricket twenty years ago is as enthusiastic and fit to play cricket again. So you need to look for new people who are of your age and are still looking forward to rekindle that love for cricket over the weekends or after office. Cuddll is quite an effective way of making friends. Trust me when I meet my college friends, I feel lost. Most of them are so preoccupied with their kids and in-laws, that they only talk about them. I feel bored because I want to meet and hang out with people who have an opinion about books, blogging, travelling and more. This is where Cuddll fills the gap. Who needs Cuddll and why? 1.People who do not have many friends in the same city as theirs can make the best use of it. 2.If you are introvert or shy to approach others upfront. 3.Those who are not looking for boys or girls only to date but are looking forward to dancing, teaching, going out, playing, discussing, meeting, celebrating anything of common interest, this is quite a cool idea to connect over. Technology and especially mobile phones have made us isolated. We are losing the human connect. I am glad apps like these are making their best efforts to bring humans closer. We were born as social animals. We can’t live without people around us, then why are we trying to do that. And it is not even making any of us happy. At the end of the day we need our close ones, we need someone to talk to, someone to laugh with. What better than having friends! Cuddll’s USP is its call to action. We make and move on over lot of friends as per age, city, situations. This time we will go looking for friends to do something together. Cuddll helps people engage in one to one interactions that go beyond physical appearances, and enables you to come forward and speak your mind in groups. It removes the pressure of sounding entertaining and engaging from the get go. It is beyond pretense. This is like going for someone only and only if you have found the one that you were looking for, because this is not about catching a coffee or settling down later. Use the #cuddll app and give me your reviews below. I would love to know if you found someone worth making a friend while I go looking for people who have similar interests as mine.